Insurance sector is witnessing significant changes due to constantly changing market drivers and strict regulatory norms. Outsourcing data entry services is much more beneficial in this complex business environment. Companies in insurance facing a tight competition and, on every day, they face new operational challenge that eats their time. These time laps costs insurance company in business loss. There for insurance companies are started utilizing outsourcing data entry services. Long time back insurance companies don’t prefer outsourcing but from many years outsourcing data entry services is a crucial part of their business. What insurance industry expects from outsourcing data entry services is easy to judge question. Insurance companies needs to perform data entry services in secure and confidential way to improve turnover ratio with effective and flexible pricing models. Outsourcing data entry services also enables insurance companies to stay focused on their business development rather than wasting time on solving operation challenges. What are the Few Popular Outsourcing Data Entry Services for Insurance Company? Outsourcing data entry services is also beneficial to new insurance company in business with various cost effective services like insurance quotes and proposals data entry, prospect and market research data entry, new producer book data entry, insurance data mining, data entry for claim adjuster and many other services. As years passed, insurance companies appreciating the importance of outsourcing data entry services. Using agile model companies in insurance industry now outsource data entry to a trusted BPO company in India and reduce operating expense drastically. Most effective use of outsourcing data entry services for insurance company is to streamline back office processes without increasing any type of direct or indirect cost. Effective outsourcing data entry services can help insurance companies to save up to 60% back office cost gradually. Insurance company need to leverage the profitability and growth using protentional of outsourcing data entry services and best companies are satisfying the needs of company in insurance sector. What Are The Benefits of Outsourcing Data Entry Services for Insurance Companies? 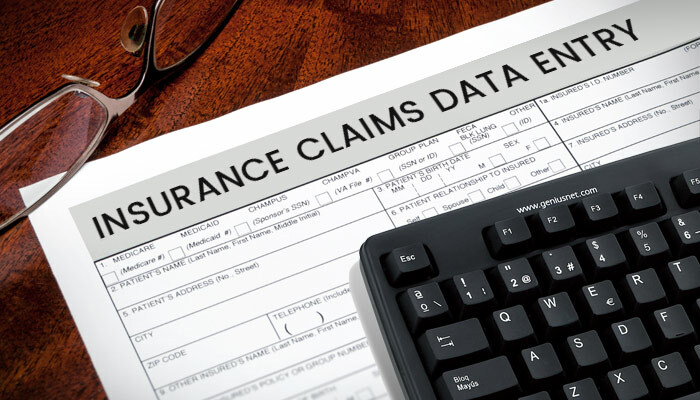 Insurance claim data entry is generally handled by competent partner and outsourcing companies in India used handle outsourcing data entry services with utmost care and help insurance company to overcome the challenge of insurance data management. Quality and accuracy of data is most important in the insurance industry, every insurance company is outsourcing data entry services to reduce redundancy. So, it is necessary for the outsourcing partner to enter all insurance claim data or other data carefully. Input data must not have any errors, including spelling mistake or unnecessary spaces which can hinder the quality of the input. High data quality and accurate insurance claim data entry can be achieved with the combination of technology and experienced resources. Time is one of the most important factors in the insurance industry. If we are talking about insurance claim data entry, claims can be raised at any time so on time arability of data is important. Outsourcing data entry services provider enter insurance data in desired time without any or negligible occupancy of insurance company. Few outsourcing data entry company like Falcon Online Services provide fast, affordable and accurate real time insurance claim data entry also with uncompromised quality. Security of data is essential in any business so for insurance industry. Insurance companies needs to care about security of data. Best outsourcing partner in India work securely with the insurance companies to eliminate the legal implications, leak of personal information, high value money transaction information etc. Outsourcing data entry services to trusted partner in India frees insurance companies all this hassle. Outsourcing data entry services provider validate and verify all the data with secure and confidential private method accompanied with secured environment. Outsourcing data entry service undertakes the risks related to insurance claims entry and processing. It Outsourcing data entry a very convenient way for Insurance companies to mitigating the risks involved with insurance data entry. Looking for Partner to Handle Outsourcing Data Entry Services for Insurance Companies? We are recognized name in outsourcing data entry services for insurance company. Our low cost data entry services for global satisfied clients in the insurance industry help them to reduce operation cost, mitigate the risk, time to enter insurance data and allow them to focus on competency of insurance company and its business development. We have dedicated to assist insurance companies. Outsourcing data entry services is accurate, quick and cost effective option for companies in insurance industry.